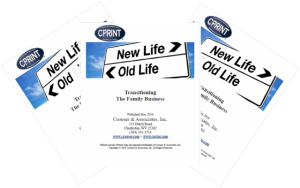 If your goal is transitioning ownership of your business to a son, daughter or even a trusted employee while retiring with an income; then you should read this report now, while you have time to do something about it. That it, if you want to transition while keeping the business, the family and our own self-worth intact. Tom Crouser has been helping business families transition for nearly thirty years now, and in this one report he gives us an outline of the process as well as shares some of the things that he has seen which can go wrong. Click on title to learn more/order. Why Sell or Transition at all? You’ll Need Income and an After-Business Plan – will you have enough cash; do you have a plan for what you’re going to do with yourself? And “Tales from the Trail,” or stories about “What Could Go Wrong?” based on what I’ve seen. This product is a PDF report which is delivered to you immediately (see receipt for download link), 21 pages.